All the rage now are group discount sites - websites that allow customers to do a group-purchase of a product or service from participating outlets and websites at a discounted rate. The way the site works is, the deal has to reach a minimum number of buyers before it is officially 'purchased'. If the deal does not reach its minimum number of buyers, then it is 'off' and the existing buyers will not be charged. Only once the deal is 'on' are the existing buyers charged, and the product sent out to them. You can purchase all kinds of products and services from these sites, ranging from vacations and hotel stays to beauty services and appliances. I was recently contacted by one of these sites, Groupon, to do a quick review of their services. Most of the time, once the purchase is finalised, Groupon sends a voucher through, which you can then redeem on the participating website. 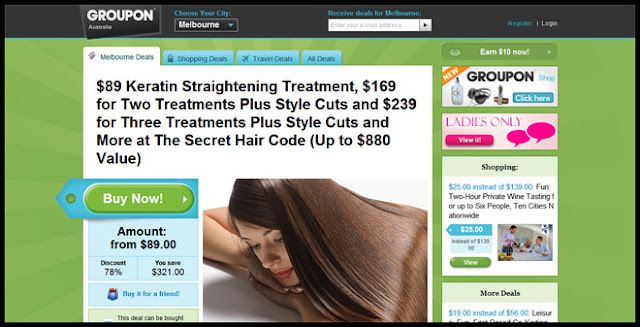 I had a browse around the Groupon Australia website to check out what they had on offer. They have two categories - Travel and Shopping. The range of products they have on their site is very impressive. They have kitchen appliances, food products and services, beauty products and services, jewellery, homeware, even language and computer courses. I settled on a rotating blowdryer to test out the speed of Groupon's service. When I purchased the blowdryer, the deal was already 'on', so I redeemed the voucher given to me by Groupon's PR on the spot. A few minutes later, I received an email from Groupon confirming the purchase. Pretty quick. The email also said that the actual voucher would only be sent after the deal ended on the website. I didn't quite like this part, mostly because I am a huge fan of instant gratification. However, the deals only last a few days so this shouldn't be an issue for most people. Then a few days later, I received the voucher from Groupon, no fuss, no foul. All the information that I needed was listed in both the product listing as well as in the email that I received. I redeemed it on the participating website and had everything done within a few days of receiving the voucher. WIN. Where I ran into a little glitch was waiting for the participating website to ship my product. I received an email confirmation from the said website informing me that my voucher had been redeemed and my purchase confirmed, but the email also said that it would take anywhere between 4 to 8 weeks for the product to arrive. I thought that was a little excessive, especially since my purchase was being shipped from within Australia. Fast forward about two months, and the blowdryer finally arrived. I was pretty disappointed with the service, and the product itself. It was a little glitchy - it would work for a while but then shut down for a long period of time before it would finally start working again - and poorly made. For the already discounted price, it wasn't worth the money in my opinion. Overall, I am extremely happy with Groupon's range of deals, their customer service, and the way they deal with purchases overall. The only complaint I have would probably be that they need to screen the companies whose services they agree to showcase on their site.